Spray four 10- to 12-ounce baking dishes with nonstick coating. Place 5 tortilla wedges in the bottom of each dish. Place remaining tortilla pieces on a baking sheet; bake in a 350 degree F oven about 10 minutes or until crisp and golden. Meanwhile, combine chicken, corn, salsa, the 3 tablespoons sour cream, cilantro, and flour. Divide mixture among dishes. Bake, uncovered, in a 350 degree F oven for 20 minutes. Arrange baked tortilla pieces atop casseroles. Top with cheese; bake for 5 to 10 minutes more or until heated through. If desired, garnish with additional sour cream, jalapeno slices, cilantro, and tomato. Makes 4 servings. Assemble casseroles as directed above, except do not top with baked tortilla pieces; place baked pieces in a moisture- and vapor-proof plastic bag. Freeze casseroles and tortilla pieces up to 1 month. To bake frozen casseroles: Bake, covered, in a 350 degree F oven for 25 minutes. Uncover; bake about 20 minutes more or until heated through. 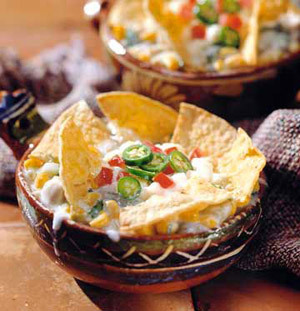 Top with tortilla pieces and cheese; bake for 5 to 10 minutes more or until heated through. Garnish as above. To micro-cook frozen casseroles: Cover microwave-safe casseroles with waxed paper; micro-cook on 30% power, allowing 4 minutes for 1 casserole and 5 minutes for 2 casseroles. Continue cooking, covered, on 100 percent power until heated through, allowing 2 to 4 minutes for 1 casserole or 3 to 6 minutes for 2 casseroles, rotating the dishes once. Top with baked tortilla pieces and cheese; micro-cook, uncovered, about 30 seconds more or until cheese is melted. Garnish as above.